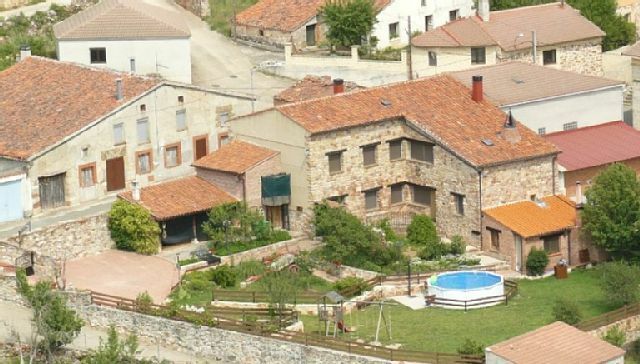 We have 2 lodgings, La chimenea de Soria I and II, which can be rented together or separately. located in the surroundings of a beautiful natural spot, the Cañón de Río Lobos Natural Park, and categorized with 4 stars (4 ****). Each of them has: 4 double rooms, two bathrooms, kitchen, living room fully equipped, can be rented separately or both together. On the ground floor, the Chimenea de Soria II, one of the rooms, has the Typical Castellano Fireplace and 3 beds. Its geographical location makes it possible for the traveler to enjoy a bucolic environment of great scenic beauty. The houses, built in stone, have independent access, the Chimenea de Soria I, for the Real street and the Chimenea de Soria II, for the farm. When they are rented together, it is as if it were a first and a bass, an internal staircase communicates them. Each house has 4 bedrooms, 2 bathrooms, living room with kitchenette and picnic area with barbecue. The houses are fully equipped with low-energy appliances: dishwashers, washing machines, refrigerators, ovens, extractor hoods, microwaves, coffee makers, toasters, squeezers, blenders, pots, pans, frying pans, and cutlery. Casa con encanto y Mucho encanto!!!!! Lo primero los dueños, encantadores, te explican todo, te asesoran sobre tus excursiones, se les ve qu están encantados con su trabajo de "Cicernes", viven su pueblo y sus alrededores, sepues tu observas sus maravillosos paisajes, todo su entorno un encanto!!! !